For over thirty years, Steve Nease’s editorial cartoons - beloved and longtime residents of The Oakville Beaver’s pages - have been poignantly illustrating Oakville’s responses to municipal, provincial, federal, and international landscapes. 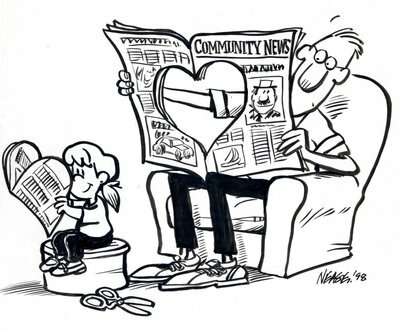 In 2007, The Oakville Public Library had the privilege of acquiring a piece of Nease’s collection, which primarily consists of editorial cartoons from the 1980s, 1990s, and early 2000s. It is an exciting collection to have, as it provides an exceptional visual reference to three very eventful decades in Canadian political history. Not only do the cartoons illustrate events, but their commentary, often informed by collective sentiment, is revelatory of how those events were received by the public. This exhibit aspires to provide an overview of the Library’s collection, showcasing Nease’s cleverly astute visual documentation of the political characters and monumental events that, for better or for worse, shaped the Canada we know today. It also aspires to illuminate Nease’s artistic process and to reflect on the unique way the editorial cartoon contributes to a community’s understanding of their history. Most of all, it seeks to pay tribute to a local artistic treasure, a purveyor of insightful vignettes that serve to capture, elucidate, and preserve our history - an artist who could make us laugh, read our minds, and who always knew the right thing to say.